[reprinted from NFTE #214] A number of contributors to NFTE from downunder have commented on the 26 year drought that we have endured since the one and only Yes tour in 1973. I was fortunate to see them in Sydney - not that I was a Yes fan at the time. I was really only aware of I've Seen All Good People as it had received limited airplay and modest chart success a few years earlier. In the early seventies I was a uni student willing to try most things once -- and that was my attitude towards music. Touring bands from overseas were not common so along with my friends I tried to see as many acts as possible. Jethro Tull, Focus, Santana, Joe Cocker, Cat Stevens and Lou Reed featured amongst the eclectic array of performers. So my decision to see Yes was based on that attitude and the recommendations of friends. When they arrived in Sydney they were featured on the evening news and I remember most attention was given to Rick Wakeman's police siren that was used in his solo at the time. The concert was held on a balmy March evening - early Fall in Australia. It was held in the Hordern Pavilion, a converted agricultural show pavilion that was the main indoor rock concert venue in Sydney in the seventies. At the time the Musician's union in Australia had an edict that every overseas act had to have an Australian performer on the program. So the opening act was a relatively unknown group called Mother Earth that subsequently split up and would have disappeared into complete obscurity except that their lead singer, Renee Geyer, has since become an icon of Australian R&B. She sang exceptionally well and I recall that Jon Anderson commented on her favourably in the local media. The interval seemed to stretch for nearly an hour -- the audience were getting restless. Suddenly the lights started to dim and the strains of the 'Firebird Suite' were heard as we fled back to our seats. I was so naive that I thought perhaps this was a Yes recording! Anyway all was revealed within minutes as that spectacular opening to their show unfolded with Wakeman playing the last chords under a spot with his long blonde hair cascading over his golden cape. Then suddenly the full stage lights came on as the group erupted into Siberian Khatru. Of course all of this has been so brilliantly captured on Yessongs and to this day just listening to that opening track brings back floods of memories along with a tingle down my spine. The concert stunned me. Never before had I been so enthralled by the intensity of performance, musicianship, stagecraft and music itself. Only knowing one of their songs was no impediment. I was amazed at the length and complexity of their songs, yet at no time did they seem too long. The interaction with the lights added another dimension with each sequence being accompanied by the appropriate colours, creating an ambience that at the time had not been seen before in Australia. All commonplace now but not then. Rick Wakeman particularly caught my attention. At the time I regarded keyboards as largely an accessory to a rock group. For the first time I could see how they could be vital to a groups performance, sharing the limelight with guitars and vocals. The range of keyboards that he played simultaneously was new to Australia. He influenced many budding keyboard players. 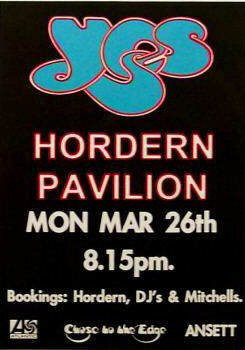 The concert was held on a balmy March evening in 1973 - early fall in Australia, in the Hordern Pavilion, a converted agricultural show pavilion. The opening act was a relatively unknown group called Mother Earth that subsequently split up and would have disappeared into complete obscurity except that their lead singer, Renee Geyer, has since become an icon of Australian R&B. She sang exceptionally well and I recall that Jon Anderson commented on her favourably in the local media. The interval seemed to stretch for nearly an hour - the audience were getting restless. Suddenly the lights started to dim and the strains of the 'Firebird Suite' were heard as we fled back to our seats. I was so na�ve that I thought perhaps this was a Yes recording! Anyway all was revealed within minutes as that spectacular opening to their show unfolded with Wakeman playing the last chords under a spot with his long blonde hair cascading over his silver cape. Then suddenly the full stage lights came on as the group erupted into 'Siberian Khatru'. Of course all of this has been so brilliantly captured on YESSONGS and to this day just listening to that opening track brings back floods of memories along with a tingle down my spine. The concert stunned me. Never before had I been so enthralled by the intensity of performance, musicianship, stagecraft and music itself. Only knowing one of their songs was no impediment. I was amazed at the length and complexity of their songs, yet at no time did they seem too long. The interaction with the lights added another dimension with each sequence being accompanied by the appropriate colours, creating an ambience that at the time had not been seen before in Australia. All commonplace now but not then. Rick Wakeman particularly caught my attention. At the time I regarded keyboards as largely an accessory to a rock group. For the first time I could see how they could be vital to a group�s performance, sharing the limelight with guitars and vocals. The range of keyboards that he played simultaneously was new to Australia. The audience was won over early and by concerts end nobody wanted to leave. We sat in the car park for quite a while later trying to summon courage to drive away as I was so emotionally drained by the experience. PAUL DAINTY Corporation director Ron Blackmore will try to head off threatened union action against the Yes group's Sydney concerts in a pre-concert conference tomorrow. He expects to resolve the issue in talks with officials of the Theatrical and Amusement Employees Association, which has demanded that the English technical staff on the tour be supplemented with an equal number of Australians. Yes appears at the Hordern Pavilion tomorrow and Tuesday nights, and it should be quite a show. the technical perfection for which the group is noted will be enhanced by 62 fog lights, four follows, fog machines, flashing lights and sirens. NEVER before has the promise of a half-hour interval been welcomed as it was at the Hordern Pavilion last night before the performances of the British group Yes. The delay seemed short and was well worth while since Yes put in an earnest aural display. The five members were strung across the stage like, in the lyric parts, rakes celebrating in a shady glen before, in other sections, they soared past inaccessible crags and rode like Cossacks across the steppes. The music was like that - it was romantic, evocative, orchestral, portent ion. The central figures were the keyboard player, Rick Wakeman, the singer, Jon Anderson, and the guitarist, Steve Howe. There were joined by base-player Chris Squire and drummer Alan White. Wakeman had long blond hair and a floor-length silver cape and stood inside a semi-circle of electronic consoles - an organ, piano, Mellotron and synthesizers. During one solo, he managed the Hallelujah Chorus followed by an ensemble of sirens. Anderson was like a boy choirster singing joyfully amid the swirling electronic clouds. Yes are not innovators. But, as so often seems to happen, they were brought up on free-form style and so they adopt it with an ease impossible for the pioneers. They deserved the enthusiastic applause. And so too did the local blues group, Mother Earth, who blew a good impression by trying miles too hard during their climax. Yes, Yes, Yes,. Five of England's most progressive musicians will be performing at the Hordern Pavilion on March 26. The reviews, both for recordings and performances, that Yes has received over the past two years have been excellent. At the moment they are one of England's most popular bands. As individuals, each has earned awards from music polls for their talents on their particular instrument. Whilst in Australia their concert performance with last for two and a half hours. Their music sound equipment and stage lighting effects combine for total live production. Yes also offer quite a change from the rowdy rock acts that Australia has seen this year. Thank you very much. It really nice to be here in Australia..um. Thank you. This one's..this next one is for all [???] here in Sydney. [???]. Thank you. Steve is going to play some tunes for you. Like to carry on with a song from..um our last album really. It's.uh..a song..it is a song about a dream. A dream of political science from..um [???]. The song is called 'And You And I'. Thank you. It's really nice to be here with you..together.